Standing at the center of the Quwwatul Mosque the Iron Pillar is one of Delhi's most curious structures. Dating back to 4th century A.D., the pillar bears an inscription which states that it was erected as a flagstaff in honour of the Hindu god, Vishnu, and in the memory of the Gupta King Chandragupta II (375-413). How the pillar moved to its present location remains a mystery. The pillar also highlights ancient India's achievements in metallurgy. 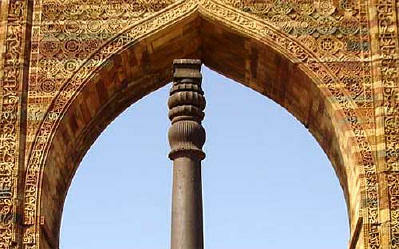 The pillar is made of 98 per cent wrought iron and has stood 1,600 years without rusting or decomposing. 7.3 m tall, with one meter below the ground; the diameter is 48 centimeters at the foot, tapering to 29 cm at the top, just below the base of the wonderfully crafted capital; it weighs approximately 6.5 tones, and was manufactured by forged welding. The sight is so familiar: each time you are in the vicinity of the Qutab Minar in Delhi, you find groups of tourists gathered around a tall, sleekly tapering iron pillar in that complex, one person from the group standing with his or her back firmly against it, and trying to make the fingers of the two hands touch while holding the pillar in embrace. Very few succeed but, almost always, there is a feeling of merriment around, since terms are set within the group and each person is 'tested', as it were, for fidelity or truthfulness or loyalty, even longevity, it could be anything. When a person fails to make the contact between the fingers of the two hands wrapped around the pillar, squeals of delight go up. This has gone on for years, certainly ever since tourist guides came into being. 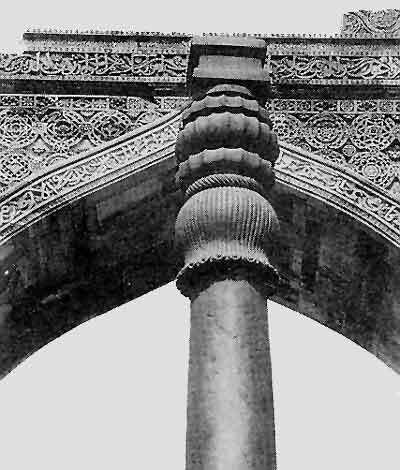 The Iron Pillar at Delhi seen through an arch. Barely anyone from these thronging groups of tourists, however, cares to find out the history of this pillar, or knows that it has been something of a riddle for people—historians, archaeologists, palaeographers, metallurgists, etc—for close to a century and a half. The pillar is now located in Delhi, although one knows almost for certain that it was moved to that place from somewhere in Madhya Pradesh about a thousand years ago. But, somehow, in my own mind, it has come to be associated also with Shimla. For that is where I have been hearing of it mostly of late. When I was there last year, at the Indian Institute of Advanced Study(IIAS), a series of lectures on the Iron Pillar were being delivered by a visiting scholar, a well-known metallurgist, Prof R. Balasubramaniam of the IIT, Kanpur. This year again, when I was in Shimla, the pillar came up, for the institute had brought out a finely detailed publication based on that series of lectures, under the title, "The Delhi Iron Pillar: New Insights." Like last year, however, a debate about the points made in the book ensued again, for there were, and are, scholars at the institute who hold other opinions on the points raised in the book. Each serious study that appears—and Professor Balasubramaniam's is certainly one—adds to the scholarship on this theme, and extends the field further. But nothing, it seems, is finally settled. Some physical facts about the pillar are reasonably well-established: it is 7.3 metres tall, with one metre below the ground; the diameter is 48 centimetres at the foot, tapering to 29 cm at the top, just below the base of the wonderfully crafted capital; it weighs approximately 6.5 tonnes, and was manufactured by forged welding. But, this said, nearly everything else about the pillar is surrounded by acute controversy: For whom was it made? Exactly when? Where did it originally stand before it was moved to Delhi? What is the true import of the long inscription in Brahmi characters engraved upon it? Who placed the later inscriptions on it, and when? Who had the pillar moved to its present location, and why? What exact processes were followed in forging it into shape at that early a point of time, the 4th/5th century AD? Above all, from the scientists' point of view, what is the secret, the great mystery, behind the fact of its being virtually non-rusting? There seems to be no end to the questions. Take the case of the Brahmi inscription alone. Readings of this six-line, three-stanza inscription in Sanskrit verse vary considerably, the one most often published being that by Fleet, who translated it in 1888. It speaks, in very poetic terms, of the powerful, all-conquering monarch who had the pillar made: "He on whose arm fame was inscribed by the sword, when in battle in the Vanga countries, he kneaded (and turned) back with (his) breast the enemies who, uniting together, came against him; … he, by the breezes of whose prowess the southern ocean is even still perfumed." But, this eloquent panegyric apart, when it comes to identifying the king with clarity, and giving further details about the erection of the pillar, the inscription suddenly leaves some questions unanswered: obviously, not for those who lived in those early times, but for later generations, for whom so much information was lost in the centuries that have gone by. Thus, the verse concludes with the words: "He who, having the name of Chandra, carried a beauty of countenance like (the beauty of) the full moon, having in faith fixed his mind upon (the God) Vishnu, (had) this lofty standard of the divine Vishnu set up on the hill (called) Vishnupada." But who exactly was king Chandra remains a puzzle. 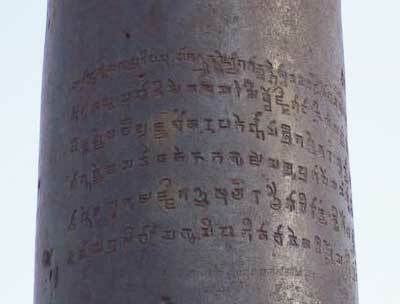 On other grounds, historical or palaeographic, it can be concluded that the pillar belongs to the Gupta period, but, from among the imperial Guptas, who is it that is referred to here simply by the name of 'Chandra': Chandragupta I, Chandragupta II, also celebrated as Vikramaditya, or, as some firmly believe, Samudragupta? Again, the Guptas were known to have been devotees of Lord Vishnu, but where was this hill called 'Vishnupada' located? Questions like these are, however, only a relatively simple sample of the issues that centre on the great pillar. There are others, very complex ones, that have engaged the minds of scholars. Prof Balasubramaniam addresses them in his inquiry without once losing sight of the sheer elegance of the pillar, especially of its exquisitely made capital atop which a figure of Garuda, the ' Sun-bird ', who is the vahana of Vishnu, or a chakra, the discus that is his emblem, might once have stood. 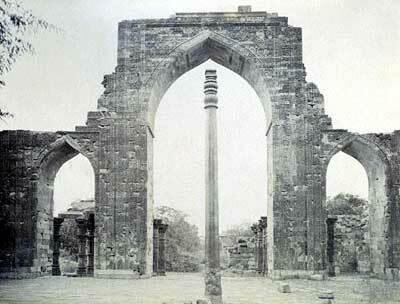 There are long and detailed chapters on the structural features of the pillar, the methodology of its manufacture, a general inquiry into other large iron objects in ancient India, including the iron pillars in Dhar and Mandu in Madhya Pradesh, Mount Abu in Rajasthan, the Kodachadri Hill in Karnataka. But, understandably, the most densely argued chapter is on the corrosion-resistant nature of this iron pillar, the P-content and the S-content of the low carbon mild steel of which it is made, the process of rust protection, the colour of whatever rust there is, spectroscopic analyses, are all themes, something that has led to its being widely regarded as a 'miracle' of technology, given the times in which the pillar was forged and erected. With all this, however, will the whole clutch of issues addressed in the book get finally settled, one might ask? I doubt it. But then this is the way it should be; this is how scholarship proceeds. "As rust, sprung from iron, eats itself away when arisen, even so his own deeds lead the transgressor to states of woe…." New Delhi, July 18: Experts at the Indian Institute of Technology have resolved the mystery behind the 1,600-year-old iron pillar in Delhi, which has never corroded despite the capital's harsh weather. Metallurgists at Kanpur IIT have discovered that a thin layer of "misawite", a compound of iron, oxygen and hydrogen, has protected the cast iron pillar from rust. The protective film took form within three years after erection of the pillar and has been growing ever so slowly since then. After 1,600 years, the film has grown just one-twentieth of a millimeter thick, according to R. Balasubramaniam of the IIT. In a report published in the journal Current Science Balasubramanian says, the protective film was formed catalytically by the presence of high amounts of phosphorous in the iron—as much as one per cent against less than 0.05 per cent in today's iron. The high phosphorous content is a result of the unique iron-making process practiced by ancient Indians, who reduced iron ore into steel in one step by mixing it with charcoal. Modern blast furnaces, on the other hand, use limestone in place of charcoal yielding molten slag and pig iron that is later converted into steel. In the modern process most phosphorous is carried away by the slag. The pillar—over seven metres high and weighing more than six tonnes—was erected by Kumara Gupta of Gupta dynasty that ruled northern India in AD 320-540. Stating that the pillar is "a living testimony to the skill of metallurgists of ancient India", Balasubramaniam said the "kinetic scheme" that his group developed for predicting growth of the protective film may be useful for modeling long-term corrosion behaviour of containers for nuclear storage applications.